Trendy bracelets are always a great way to bring attention to your arms and complement a classy outfit. Bangles and open bangles are circular and inflexible bracelets, great for stacking. Cuffs are wide bracelets that feature a gap on the inside of the wrist. Chain bracelets are metallic and come in various shapes. Beaded bracelets feature beads of different materials, while tennis bracelets have a very specific design and usually feature diamonds. Slider bracelets are adjustable, charm ones feature custom charms, and anklets are bracelets you wear on your leg. If you want to find out more about bracelets for women, we recommend reading this article. But, just as with any other piece of jewelry, there are rules when wearing trendy bracelets. There are a couple of dos and don’ts that you need to know if you want to feel and look great every time you put your trendy bracelets on. This is why we have developed a comprehensive styling guide for trendy bracelets, according to each type. Continue to read further to find out more about styling rules and fashion ideas. There are two rules when it comes to wearing trendy bracelets according to your wrist size. To achieve a proportional look you need to choose bracelets that match your wrist size. If you don’t want your wrists to look bigger or smaller, wear any type of trendy bracelets, but make sure they are the right size. To achieve a smaller/larger look for your wrists, choose bracelets that have an opposite design to the effect you want to achieve. For example, you could wear a large chunky bracelet to make your wrist look larger and vice versa. So, if you have large wrists and want to create the effect of smaller ones, bangles with medium width and chain woven bracelets are your friends. Avoid chunky cuffs or very thin bangles, as well as large beaded bracelets. Both large beads and cuffs emphasize your wrist and make it look larger, while very thin chain or bangle bracelets create a contrast that makes your wrists look wider. If you have very narrow and bony wrists and want to make them appear larger, stacked bracelets are very good for you. Other trendy bracelets are medium beads (anything round in fact), medium cuffs and charm bracelets. 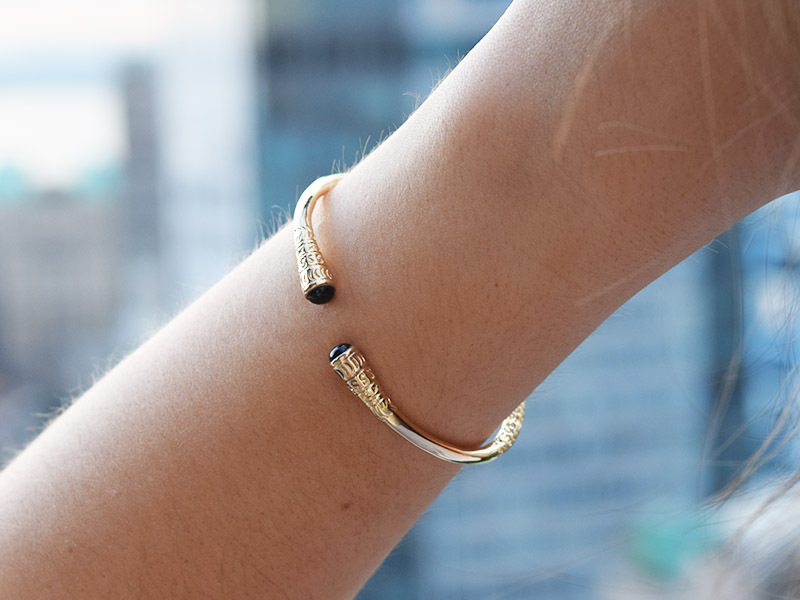 Avoid wearing a single thin bangle because the contrast will make your wrists appear even narrower. To find out how to style cuff bracelets, read this article. Many women make the mistake of not matching their trendy bracelets with the manicure type. This doesn’t mean that if you are wearing a turquoise bracelet, your nails also need to be turquoise. This is more about the style than the color of the manicure. 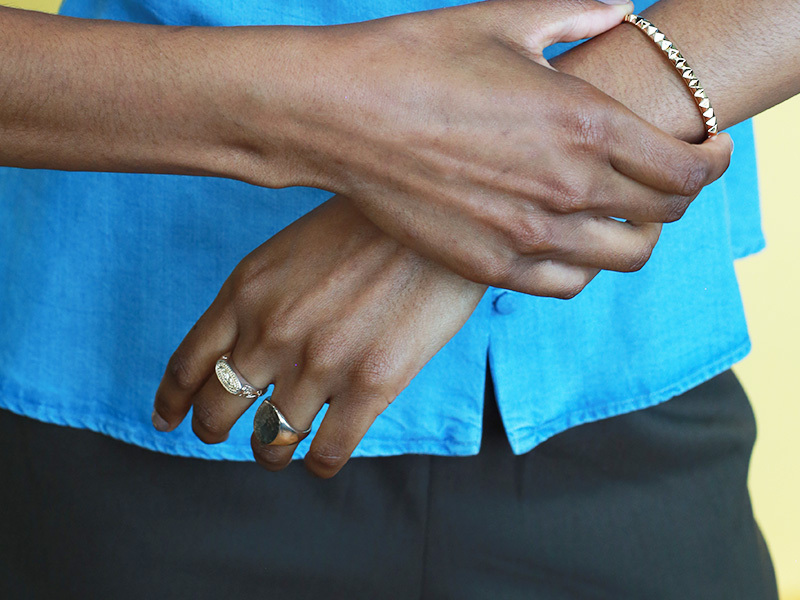 The first rule is that statement bracelets or chunky pieces require a neutral manicure. Your nails shouldn’t be too long, but for the color, you have all the freedom you want. You can wear statement or chunky pieces with medium-length or even short nails and it will look fabulous. On the other hand, with bangles you can have a vibrant manicure and long nails. To fin out more about Indian bangles, read this article. Another rule is that delicate or thin bracelets will look better with longer nails. As opposed to what happens when you match statement pieces with long nails, in this case, your nails will bring out the delicate piece on your wrist. Last, but not least, consider the bracelet style when choosing a manicure. An elegant French manicure will not look so great with friendship style bracelets, while rock-punk nails will clash with a tennis bracelet. If your nails are elegant, make sure that your wrist reflects that elegance and vice versa. 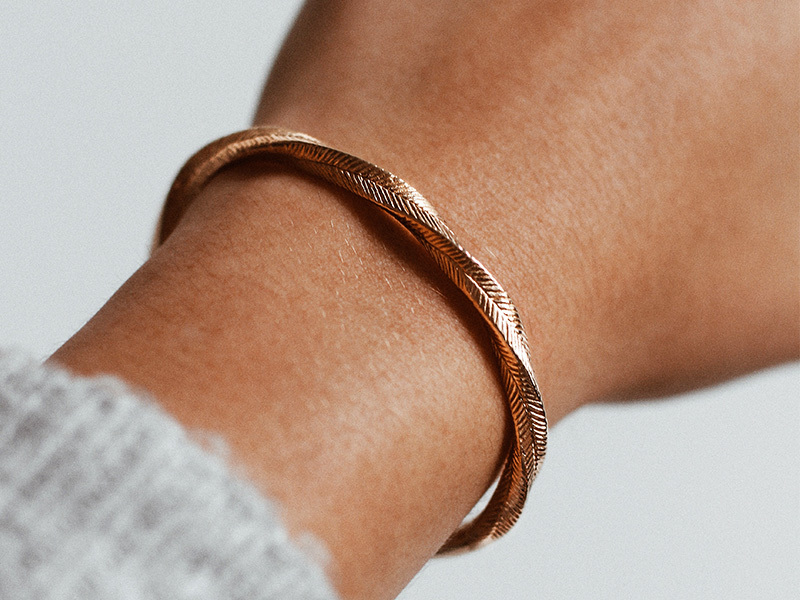 You can add a delicate thin bracelet to any outfit and it can look gorgeous. But while thin bracelets are more versatile, chunky or statement pieces require extra attention. With this type of trendy bracelets, you can wear statement earrings but forget about chunky necklaces or rings. For a contrasting look, combine chunky bracelets with chiffon, summer dresses or lace tops. If you want to achieve a professional, serious look, avoid big cuffs and charm bracelets and go for simple outfits with thin bangles or chain bracelets. To add an extra sparkle to your look and achieve an elegant ensemble, go for gemstone bracelets paired with precious studs and stylish gowns. In general, cuffs are more appropriate for formal wear or casual occasions, depending on their style. They are not, however, appropriate for work or business occasions. Bangles are versatile and can match almost any outfit, while tennis bracelets need elegant clothes. Charm bracelets are great for casual outfits or even work situations. Simple chain bracelets are great to wear when going out or to a business meeting, but not-so-great with formal outfits. Beaded bracelets can look good with anything, depending on the beads, while slider bracelets are creative and elegant. And, finally, the ankle bracelet has some very special styling rules which we invite you to read in this article. When styling your trendy bracelets you have to consider the metals and materials. Gold and gold plated bracelets are great for any skin tone and look fabulous with most of your outfits. Silver bracelets are perfect for a romantic date or a casual meeting. Wear your platinum bracelets to a formal occasion and leave your copper and stainless steel ones for informal gatherings. If you are a beginner, the best idea is to start simple. You can start with a couple of bangles in different colors and widths. The common element here is the type of bracelet you use. If you’d rather wear chain bracelets, make this your common theme and make sure they have different colors or designs. For a more sophisticated look that is easy to achieve, choose a metal theme, like gold, for example. 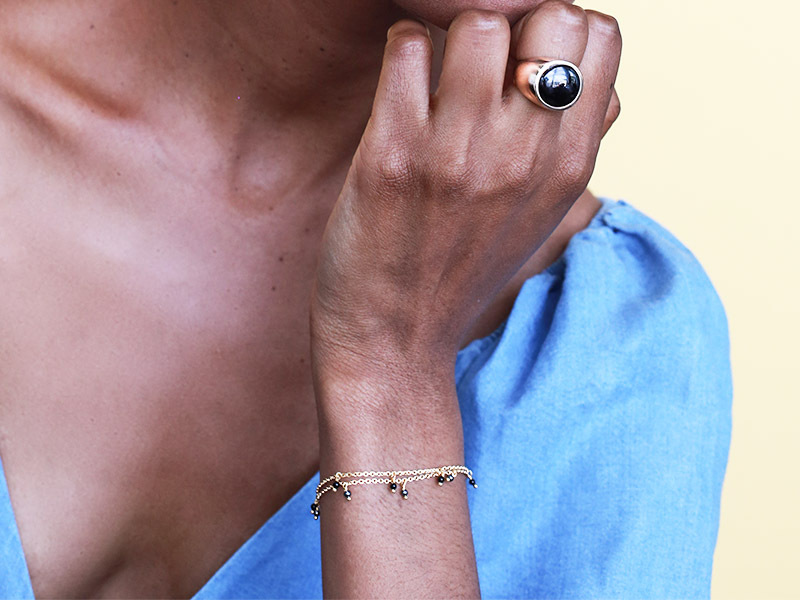 Wear bangles, cuffs, and chains all in gold. After you get more comfortable with wearing stacked bracelets, you can try other styles as well. You can go for matching colors or textures and you can even try creative combinations. For example, you can try a leather bracelet with a colorful wooden one and a stud silver bracelet. The rule of the thumb is anything goes as long as you are feeling good about yourself. If you want to find out more about how to stack bracelets, read this article. Check out Ana Luisa online jewelry shop to view our exquisite bracelets collections such as the Textured Bangles collection and the Chain Bracelets collection. How to take care of your different types of Bracelets?